Happy Halloween everyone! In honor of this special day, I thought I’d feature a really awesome ~ Halloween Wedding. Could anything be more fun?! Bride & Groom, Amy + Torry, created the perfect Halloween Wedding, featured on Green Wedding Shoes, and I just had to share! Since the bride & groom always loved Halloween, the theme suited them perfectly. The evening was filled with tons of perfect creative touches and fun surprises for guests, including featuring a band that played hits like “Thriller” and “Monster Mash” while they showed “BeetleJuice” on a large screen in the background … super fun right?! The scary decor was everywhere and guests were encouraged to dress up for the special occasion. Thank you to the amazing photographer Kristen Marie for sharing these amazing pics. 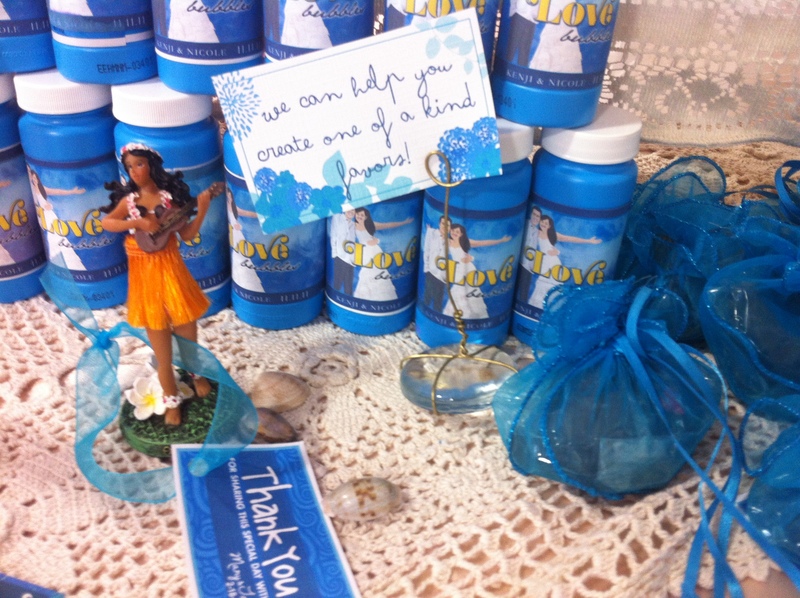 Hopefully it inspires some of you Hawaii brides to think out of the box and get creative! Uh… L O V E !! Wishing all our Hawaii Brides & Grooms a very Happy Halloween ~ !! 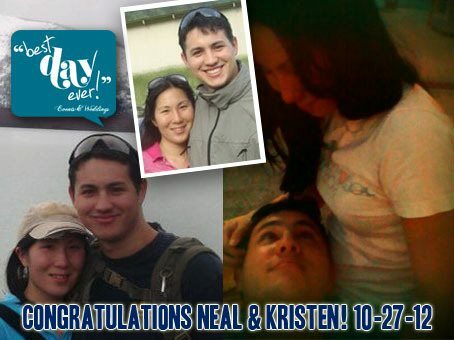 Today’s the big day Hawaii bride & groom, Kristen & Neal have been waiting for… October 27, 2012! Their wedding day! We’re so excited for the both of you and can’t wait to see everything come together for you! Cheers to your Best Day Ever! Sustainability is a beautiful thing!! Hawaii is one of those places where nature takes center stage. It’s important for us to preserve our plants and resources so future generations can experience the same beauty. I think it’s great when Hawaii weddings can incorporate things that are good for the environment. Marvelous Things Photography shot a beautiful wedding that incorporated sustainability in a meaningful and elegant fashion. The couple Danny and Janelle planted a tree together in place of doing a unity candle or sand pouring. 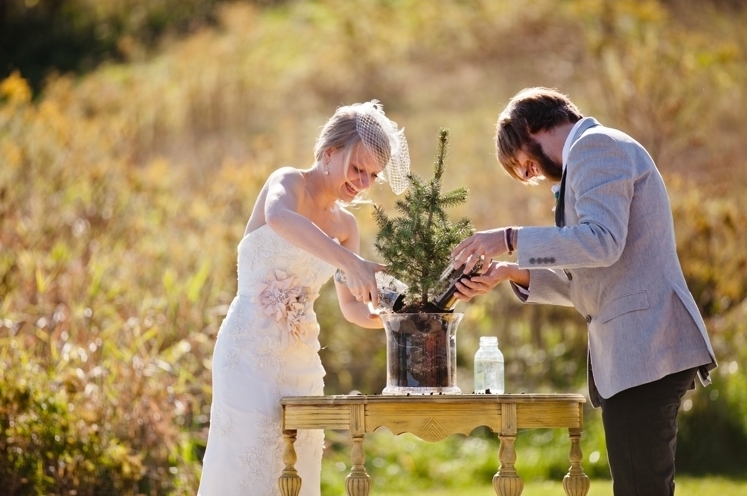 A young tree was placed into a clear vase and the bride and groom each had a small glass filled with soil which they poured into the main vase and generously watered. (Don’t worry the bride and groom remained dirt and sweat free!) The idea behind this was to watch the newly potted plant grow alongside their marriage. If you remember our previous post on the Fisherman’s Knot you’ll know that at Best Day Ever we’re all about one-of-a-kind personalized weddings. We love unique wedding touches that make a ceremony extra special. This idea has beautiful symbolism and would be a perfect addition to any outdoor wedding. We are always on the lookout for new ideas to share with our Hawaii brides but recently they have been inspiring us with some amazing ideas of their own! I was inspired to write this post by our newly wedded couple Andrea and Brian! 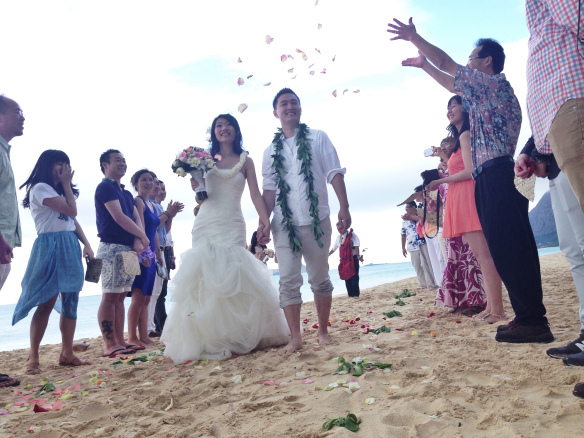 The couple had a beautiful wedding at the Hawaii Prince Hotel that incorporated the Japanese 1000 crane tradition. 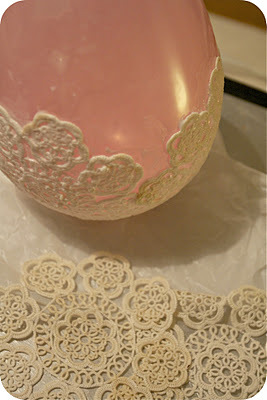 DIY Monday’s ~ Romantic Lace Candle Votives! Looking for something that can add a bit of elegance to a casual beach wedding or a whimsical vintage spin to a garden wedding? These candle votives by spirello have a rustic/vintage feel that would be perfect for any table setting! How romantical! Ok, so I totally made up that word – but don’t you love it! You’re gonna love these candle holders too! Not only are they gorgeous but they are super simple to make! 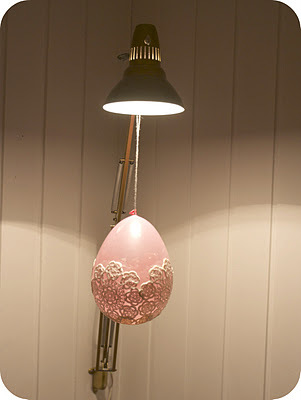 Soak a lace/crochet doily in wallpaper glue. Insert a small candle light and you’re done. 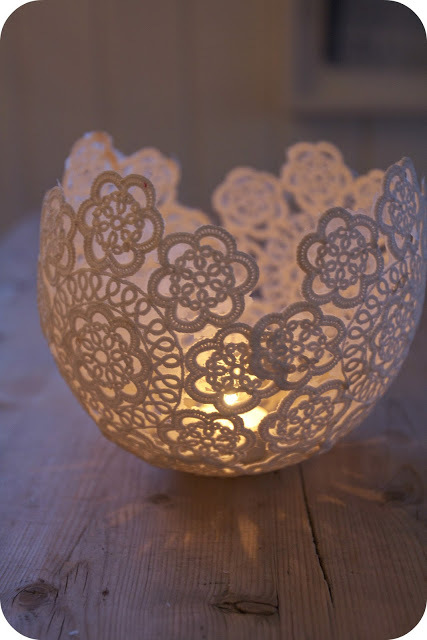 I love how the candle light shines through the dainty perfect lace shapes! Romantic lighting like this is going to be a must at my wedding! Happy M O N D A Y everyone! Most Romantic Beach Proposal EVER! In Hawaii, we love sharing special moments with our families. The love and support they show us over the years is irreplaceable and I think the way the groom was able to incorporate those feelings into his proposal made the moment unforgettable! Wow – really touching – Hope you loved it too! Ahhh, feel good Friday – it doesn’t get any better then this! Trendy Tosses – Petals or Rice? The throwing of rice at a newly married couple has been a wedding tradition for centuries. 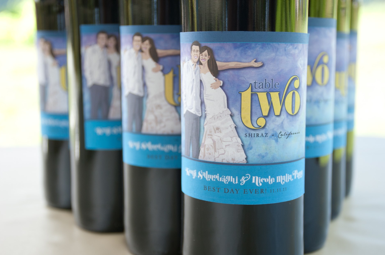 The idea originated as a way to wish the bride and groom a prosperous life together. In certain parts of the world guests would throw nuts, raisins and figs to represent a “fruitful” union. Love the play on words! 🙂 Today the traditional rice tossing has been swapped for more modern options like petals or bubbles, but the general meaning behind it remains the same. Flower Petals… try traditional flowers like rose petals or local favorites like plumerias and orchids. Best Day Ever TIP: Make sure you pick up the petals afterwards, this is something most couples never think of, but many venues require. Check with your venue to find out if petal clean up is required. You don’t want to lose your deposit because you didn’t pick up your petals. Most wedding planners are aware of this general rule and will pick up the petals for you. We definitely do, but be sure to check first! Whether it be bubbles, rice, petals or even fruits & nuts, if you do decide to take part in this fun tradition make sure to plan well in advance. It’s important to keep your venue in mind. Certain venues may limit you on what you can and cannot throw. If you’re having an outdoor wedding make sure to choose items that are biodegradable or that can easily be recollected. You want to make sure your venue will be picture perfect for future brides! What are you thinking? Petals or bubbles – Or maybe it’s something else completely, we’d love to hear your thoughts! Do share! Happy Tuesday Hawaii Brides & Grooms ❤ Happy Planning! Starting a gift registry can be a lot of fun as well as a little stressful. There are tons of items out there to choose from and it can be a bit overwhelming if you don’t know where to start. Squirrelly Minds breaks down the basics of gift registry. 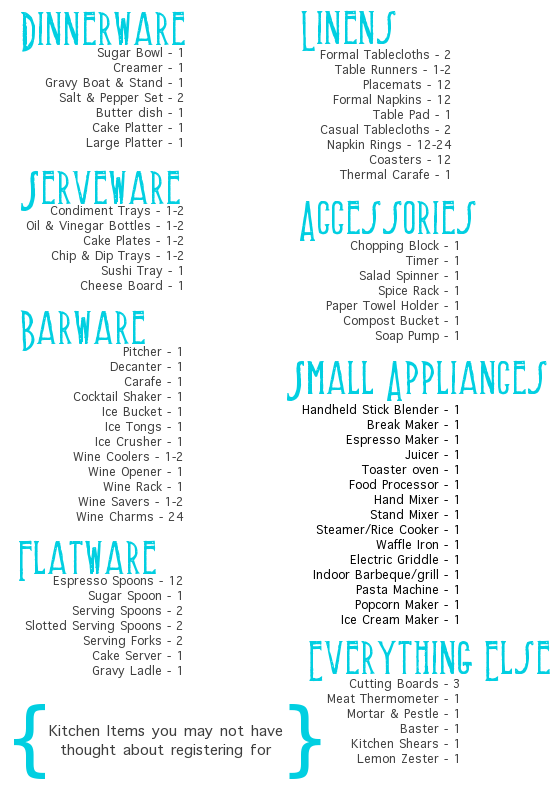 Follow these simple charts to ensure you and your guests get exactly what you need. How many items should I register for? 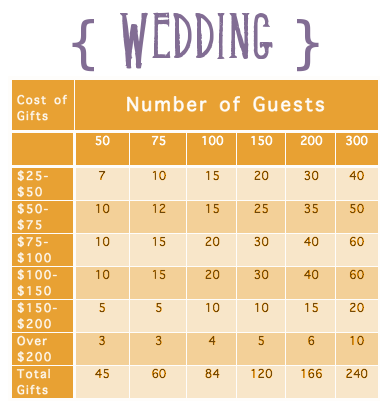 Start off by determining how many guests are attending your wedding and then use the chart below to break that number down into different price points. The last row shows how many total items to register for. What items should you register for? Happy Friday !! Yay for the weekend! 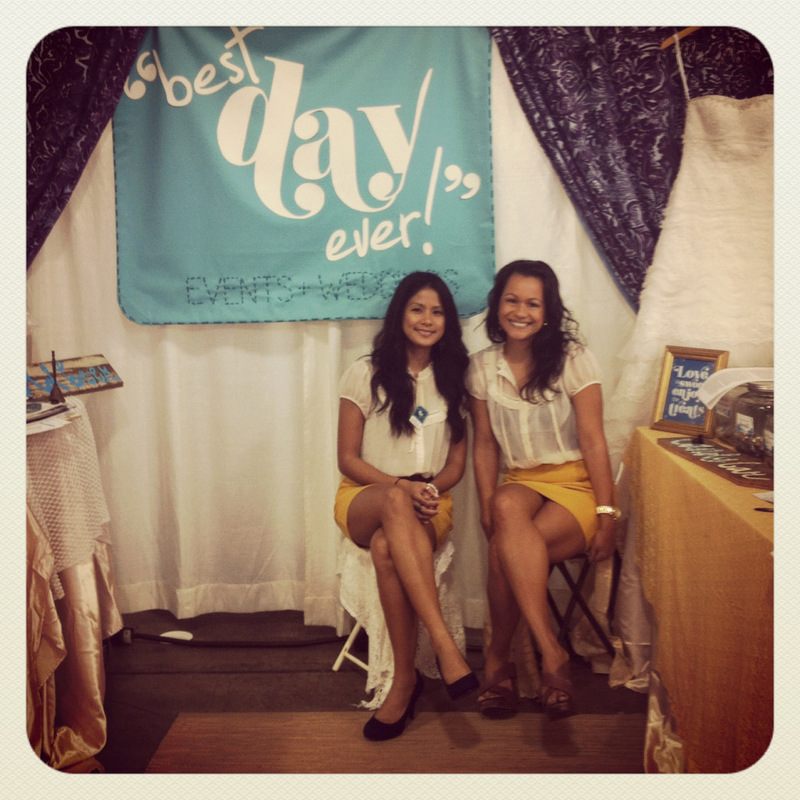 Each week we try to feature a super special vendor whom we think our favorite Hawaii brides-would love! This week, we are featuring Creatrix Photography- local photography company owned by Jenna Clark a fun loving, hopeless romantic and a strong believer of love. 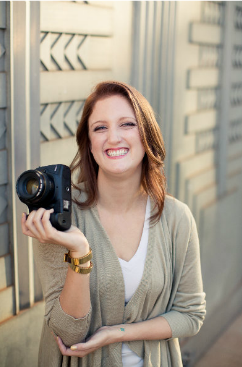 Jenna started her business in March of 2011 but has years of photography experience. We love her enthusiasm and dedication! After seeing her work I’m sure you’ll love her as much as we do! What makes your style or you as a photographer different from other wedding photographers? My goal at the end of the day isn’t to take a bride’s money, but to become her friend. I want to hang out, have a glass of wine and giggle over weddings and the men in our lives. I want to be emotionally invested in her special day, because the images are a billion times better that way. What kind of experience can couples expect when they work with you? I’m a boutique wedding photographer so I only photograph three weddings a month. This allows me to focus on each couple as they should be focused on. It’s their wedding day and there is no reason they should be a number on my calendar. I respond to most emails within eight hours, I make custom websites for my clients, I like to buy them drinks to get to know them, I show up early to all of my weddings and I deliver images in 30 days. I like to keep everything simple for my clients, to avoid confusion. What are a few of your favorite past wedding experiences? My most recent favorite was the wedding I shot in Seattle, Washington. The bride flew me to Seattle, after talking with me for months in a coffee shop (she was my barista!). The wedding took place in a modern barn, she wore a gorgeous dress with a vintage veil and was fabulous! I was given an hour to just photograph her and her husband, which was awesome!!! I feel that if you’re paying thousands for wedding photography, you should make the time on your wedding day to get your money’s worth! What is your avg. price range for packages? On average, my brides can expect to spend around $3000 to get all of their bases and wedding covered. Are there any key things couples should look for when hiring a photographer? 1. Usually, cheaper is not better. I put in, on average, 30 hours into a wedding. With all of the emails, meetings, research, day of work, editing, more emails, insurance, equipment and gifts, it adds up. I like to spoil my clients, but this would be impossible if I charged $800 for a wedding. 2. Find someone you like. I know this seems like a “duh!” moment, but most brides don’t realize that photographers are there with you more than anyone on your wedding day. We see you happy, sad, scared, nervous and sometimes, angry. You need to hire someone you REALLY like, otherwise you’ll be unhappy with the results. 3. Ask to see examples of full weddings. Our websites showcase the best of the best, because the average consumer spends about 30 seconds on a website at initial arrival. If we don’t catch your eye immediately, we’ve failed. So when you find someone you adore, ask to see full weddings, so you know how they shoot receptions and other moments. If someone can’t show you at least two full weddings, run for the hills! Are there any details or things to look out for couples should think about on the day of a shoot? I prefer brighter colors and always tell clients to avoid neutral colors, like khaki, forest green, navy blue or brown in any form. Accessorize and do your nails! Get your hair and makeup done! These images will be with you for the rest of your life, so take a break and let a professional take care of you! A week before the wedding, I normally email a bride and remind her to bring a nice hanger for her dress. Nothing ruins a hanging dress picture like a hideous plastic hanger. I also remind her to wear a nice outfit while getting ready. I’ve had brides walk around with their business hanging out and those images have to be deleted. The best light is an hour after sunrise and an hour and a half before sunset. Keep this in mind for your ceremony and pictures! I would strongly suggest working with your photographer on locations and even visit the venue with them prior to the wedding, at the time your wedding will take place. This helps you collaborate with them and help start a vision of the day! Any special tips for couples looking for a wedding photographer who are tight on budget? Some photographers give discounts to weddings on a weekday, but I’m a strong advocate for not skimping on wedding photography. The wedding day passes VERY quickly for everyone and at the end, the only way you’ll remember certain details is when you look at your photographs. DO NOT spend less money on someone, unless you’re POSITIVE you’ll be pleased with the results. I really believe photography is an investment in your memories. Don’t haggle on what is the one form of capturing your day for the rest of your life. What is one tip you can offer couples in regards to photography on their wedding day? Do a first look! Besides the emotional benefits of doing a first look (i.e. getting the tears out of the way in private, having a moment with your honey before the chaos of the day begins) you can also get the pictures of the both of you done immediately. That way, if the ceremony or family pictures run long, you won’t have lost time for just the both of you. We love this tip Jenna:) Couples take note – all of these tips are really good ones!! What is one tip you can offer couples who are planning their wedding… something they may have overlooked that could make their day run smoother or something they should keep in mind on their big day? The one thing I would say to keep in mind, is that at the end of the day, you’re married. So on the day, don’t stress anymore because there is nothing that you can do. Did the florist bring the wrong flowers? Minister drunk? There’s nothing you can do, so just choose to enjoy the day! There you have it! 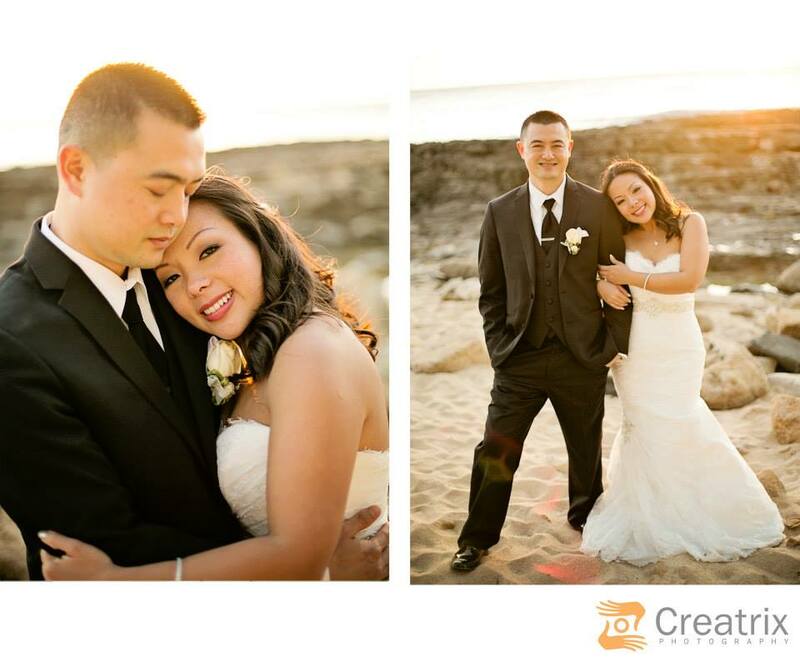 Our featured vendor of the week – Hawaii Wedding Photographer, Jenna from Creatrix Photography. If you’re still looking for a photographer for your special day, be sure to check her out! Hope you enjoyed the tips from Jenna ~ and our little glimpse into Creatrix Photography… Until next time, Happy Wednesday! Inspiration Tuesday’s ~ We LOVE Ombre! Ombre has been a HUGE trend this summer!! Even as we transition into fall, this trend is showing no signs of slowing down! What is “ombre” anyway? Well, let me fill you in, the word “ombre” you use colors in similar tones or shades to fade into each other graduated from light to dark. This trend is most commonly used to refer to a coloring hair style but I’ve noticed that many brides have begun using this idea as inspiration for all parts of their wedding! Loving this styling sample below in shades of blues! From frosting to the actual cake color, ombre has changed the typical white wedding cake in a colorful and dessert! Gwen Stefani’s may have been one of the first few brides to rock an ombre wedding dress. She looked stunning in a fun dress that transitioned from white into a vibrant hot pink! If you have one or two bridesmaids you could follow the same idea as above including all shades in one dress. If you have multiple bridesmaids try having each girl wear a different shade and arrange them from light to dark. If you liked out accent nail post you’ll love this! Taking similar shades and paint each nail a different color darkest to lightest, from the thumb to the pinky. You can also try ombre-ing each nail by painting a solid base coat and sponge painting along the tips slowing getting darker as you reach the ends. The ombre trend is a beautiful way to utilize color. Don’t limit yourself to the above three! I’ve seen the ombre trend on everything from place cards to flower arrangements so explore some of your own ideas! Here’s a final tip: Utalize bright colors for an outdoor summer wedding and darker and warmer shades for an indoor fall wedding. Hope love this trend as much as I do! Let us know what you think! 🙂 We’d love to hear your thoughts!